Contrary to Summerson's reading, and given the scale of this drawing, it is likely to represent Soane's design for completing The Stone Building's façade to St Margaret's Street as an integral part of the New Law Courts. 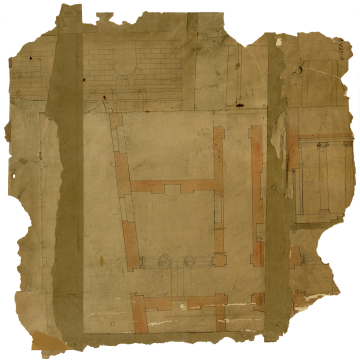 Conversely, Summerson postulated this was a survey drawing (see note enclosed with this drawing). The model for this design was provided by the existing flanking range and pavilion tower, executed to John Vardy's design, and standing south of the building's central block between St Margaret's Street and Old Palace Yard. Revisions (in pencil) suggest raising the head of the arch, making it stilted, and increasing the size of the keystone so it breaks into the course above. While the former is characteristically Soanian, the latter motif echoes Vanbrugh. This ground-floor arch acted as the entrance to the Court of King's Bench.